I think Doug Henwood is now officially the king of the Bernie Bros. Here we see a self-described Bernie Bro on reddit citing Henwood. The Bernie Bros have been attacking me on my own FB newsfeed for days for posting pro-Hillary and anti-Sanders stories. The Bro phenomenon is so bad even the Sanders campaign realizes it's a problem. 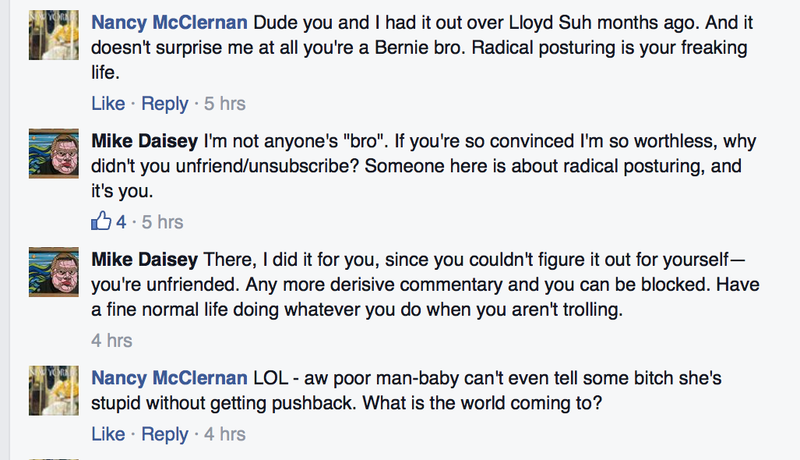 However I think that Mike Daisey is the true exemplar of Bernie Bro-dom. I've blogged about Daisey before - once in 2012 in the aftermath of the scandal he caused This American Life by lying about his sources, and then just a few months ago over a theater kerfuffle. I was not at all surprised to discover that Daisey was a Bernie Bro - he is not interested in accuracy and he likes to posture - like your standard member of the Radical Chic. So of course he had to jump on a discussion I had going on my FB newsfeed to tell me what a moron I was for providing a link to this article from the American Prospect, The Trouble with Bernie Sanders's Revolution. So to be clear - he came to my FB feed looking for a fight - and then claimed I was trolling. Damn, I've said it takes a massive lack of self-awareness to be in the Radical Chic but it still stuns me even now how extreme the lack of self-awareness is. I called him a man-baby. And he defriended me. Imagine my dismay.